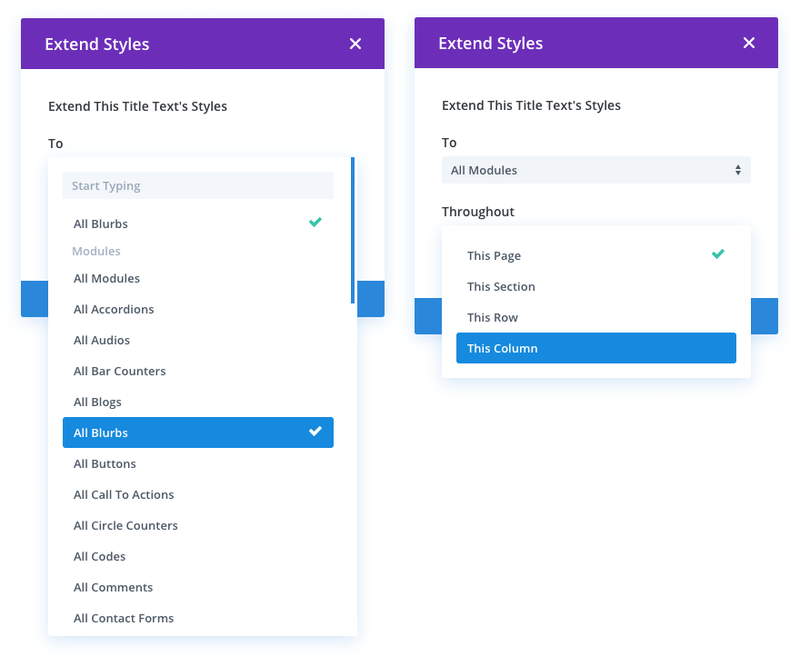 Extend Styles is Divi’s most amazing design efficiency improvement yet, allowing you to extend any design style from one module across the entire page in a single click. Extend Styles is a brand new feature for Divi that expands upon some of its most unique and useful innovations. Extend Styles allows you to take any customized style and extend it throughout the page, or to specific elements within specific locations with the click of a button. What could normally take hours can now be accomplished in just a few seconds. If you like a color, font, border style or box shadow, and you want to use it elsewhere on the page or even across the entire page, you can now extend those styles and make sweeping changes in no time at all. It really feels like magic! Extend Styles allows you to make sweeping design changes across your entire page and save hours upon hours of design time. Let’s say you have finished wireframing a new page, and now it’s time to start customizing the design. Instead of applying your desired title font, weight, color and text size to every single module one by one, you can simply extend those styles to all modules instantly. Let’s say you want to use a unique box shadow and border style combo on all of your page’s images. Simply right click on an image module and extend those styles across the entire page with a single click. You can even extend styles within specific and uniquely designed locations by limiting the extension to parent rows and sections. Extend Styles expands upon some of Divi’s recent fluid styling innovations such as Copy Paste Styles and Find And Replace. Unlike Find And Replace, however, Extend Styles isn’t limited to finding and replacing specific values, but instead can be used to transfer design styles to any module, regardless of its current design. This means you can take freshly built pages and quickly transform them into something wonderful, or take existing designs and quickly take them in entirely new directions. Extend Styles is available today, so download Divi and it for a spin. Let us know what you think in the comments and don’t forget to check back next week for even more great Divi features coming your way. The post An Amazing New Way To Build Pages In Divi! Introducing Extend Styles appeared first on Elegant Themes Blog. Review and opinions of An Amazing New Way To Build Pages In Divi! Introducing Extend Styles theme.